Did you miss our City Council Candidate Forum? Here are all the questions that were asked of the candidates along with their answers. For the questions that were answered at the mic, please listen to the answers. Question #1 (Video at 10:39): Recently we have had several villages press on our council to maintain the master plan of Irvine. What will you do to improve transparency and communication between the residents and our local government? Question #2 (Video at 23:47) – Yes or No? The Irvine Unified School Board recently adopted district-based elections instead of at-large elections. District voting divides Irvine into 5 districts. Each district would elect a candidate from their district. Do you think the City of Irvine should do the same for city council seats? Question #3 (Video at 24:19) – Yes or No? This past June, Irvine residents voted on contentious Measure B regarding the veteran’s cemetery. Will you pursue having a Veteran’s Cemetery built at the original ARDA site? 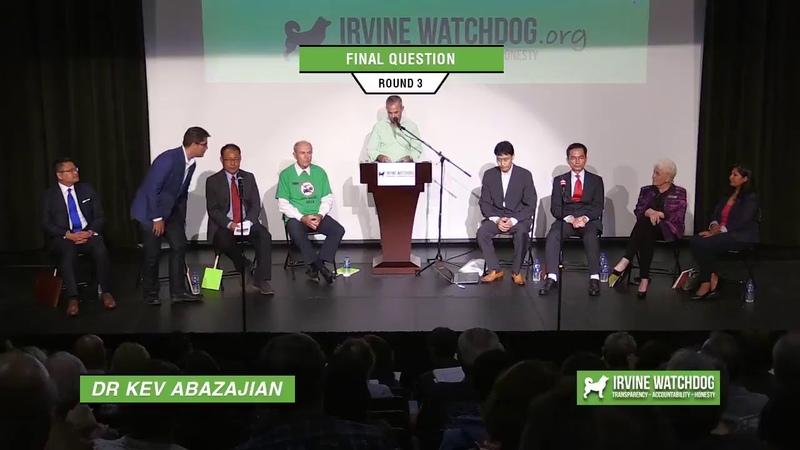 Question #4 (Video at 24:26) – A judge mandates Irvine to take 50 homeless people. What do you do? Question #5 (Video at 35:34) – Yes or No? The Irvine Community Land Trust was created in 2005 by the City of Irvine to provide secure, high-quality affordable housing. The Land Trust receives funding from Irvine taxpayers. This year, the Land Trust Board voted to block public access from its meetings and minutes. Do you think the ICLT should allow public access to its meetings and minutes? Question #6 (Video at 36:13) – Yes or No? Have you received any donations, either directly or indirectly, from corporate-PACs, major developers, or developer lobbyists? Question #7 (Video at 36:35) – Our city has seen unprecedented growth. We have overcrowded schools and traffic issues as a result. What is your traffic solution for our city? Question #8 (Video at 49:05) – Yes or No? Every candidate for public office in California who signs the Code of Fair Campaign Practices vows to follow the basic principles of decency, honesty, and fair play. Have you signed the Code of Fair Campaign Practices? Question #9 (Video at 49:30) – Yes or No? remove Irvine from being a Sanctuary City. Do you think Irvine should remain a Sanctuary City? Question #10 (Video at 50:18) – Do you think housing affordability is an issue in our city? If yes, what do you plan on doing to improve housing affordability? Question #11 (Video 59:49) – Irvine City Council is considering to remove Irvine from the OC Fire Authority. What is your opinion on that issue? What should Irvine do moving forward? Question #12 (Video at 1:09:46) – What can you offer our city that is unique from the other candidates? Questions were culled from a list of submissions by Irvine city residents. A complete list of question submissions can be found here.